[Wadhams] said that assassins may have murdered scientists who were seeking to reveal how rapidly global warming was melting Arctic ice… [and] believed that he had also been targeted but had a narrow escape after a driver of an unmarked lorry tried to push his car off the M25. Professor Wadhams faced criticism this week after a study contradicted his prediction that Arctic ice was melting so fast that it could all disappear this summer. Asked by The Times for his response to the discovery that the total volume of ice grew 40 per cent in 2013, Professor Wadhams insisted that there was still an outside possibility of the Arctic being ice-free this year [in 2015 – NB]. Top left: Peter Wadhams. Top right: Seymour Laxon. Bottom left: Katharine Giles. Bottom right: Tim Boyd. He then said there were only four people in Britain who were “really leaders on ice thickness in the Arctic” and he was one. The others, he said, had died in early 2013. 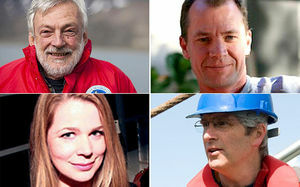 He named the three as Seymour Laxon of University College London, Katharine Giles, a climate change scientist who worked with Professor Laxon at UCL, and Tim Boyd of the Scottish Association for Marine Science. Professor Laxon died after falling downstairs at a New Year’s Eve party in Essex; Dr Giles died in a collision with a lorry while cycling to work in London; and police said they believed that Dr Boyd was killed by lightning as he walked near a loch in Scotland. Professor Wadhams said that about the same time he was driving on the M25 late at night when the lorry hit his car. “This guy showed definite evidence of malevolence. He was trying to run me right off the road.” He said his car was damaged but he managed to get home and called the police the next day. He was told no action could be taken. While Wadhman’s claims may seem outlandish, it’s not beyond the realm of possibility that scientists working in certain areas might be discretely bumped off. Post 9/11, a flurry of microbiologists died in mysterious circumstances. More recently, a pattern has emerged of holistic medical doctors and practitioners meeting untimely demises. In the case of the microbiologists, it’s either known, or considered very likely, that their research connected into high-level military/government projects and sensitive research areas. It’s less clear-cut how natural health practitioners could present such a threat to the Powers that Be that they merit ‘termination’. While a string of suspicious deaths of researchers in particular fields is not necessarily evidence of a conspiracy or cover-up, it’s also true that powerful interests may wish to, at any time and in any field, snuff out apparently innocuous research. Science can indeed be dangerous work. 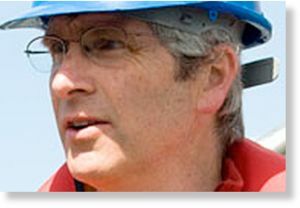 The problem with Wadham’s claim however is that the research he and his former colleagues were engaged in supports the dominant man-made global warming theory. ‘Warmists’ are a godsend to those in power because it deflects blame for increasing climate chaos from powerful and extremely wasteful institutions like central banking and the US military onto the masses of ordinary people. But still, Wadham has a point: the odds of three out of four of Britain’s top researchers in one specific field dying in unrelated incidents over a relatively short time are rather large. If we run with Wadhams’ suggestion for a second and assume that his colleagues were killed in such a way as to make their deaths appear accidental, then that would suggest they were killed by high-level military-intelligence operatives. Only such types would have the clout to pull off the deeds, manage the crime-scenes, influence the investigations and vector media coverage. As to motive, what if these apparent ‘warmists’ research was leading them to conclusions that posed a serious challenge to the official narrative? I imagine that hard evidence supporting the case for sudden glacial rebound would be high on the criminal elite’s blacklist. 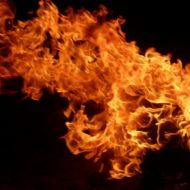 The Powers That Be want people alarmed, but in a controlled manner, and by a false narrative that blocks awareness that something big is happening on a global scale – now, not in some distant future. Speaking publicly about such civilization-ending scenarios won’t necessarily bring danger on anyone’s head. 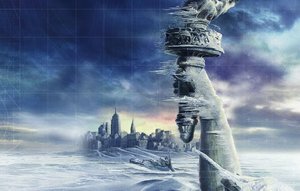 It’s no secret that a number of scientists from all over the world are leaning towards some form of ice age scenario. But what counts is the standing of the person saying it. Even if they only say certain things to their peers in private, the Powers That Be are ever-alert to ‘sedition’ within the lower ranks. When Dr. David Kelly knew for a fact that British government claims about Iraq’s WMDs in the run-up to the Iraq War were false, he didn’t stay silent. He was an expert in that very field and could prove what the Iraqi military did and did not have in its arsenals. British security operatives forced the journalist who anonymously cited Kelly’s expertise to publicly reveal Kelly’s name, at which point they discredited Kelly in trial-by-media, then physically ‘suicided’ him. The reason they went to such lengths was because of Dr. Kelly’s public standing and specific knowledge which made him unlikely to give in to intimidation. 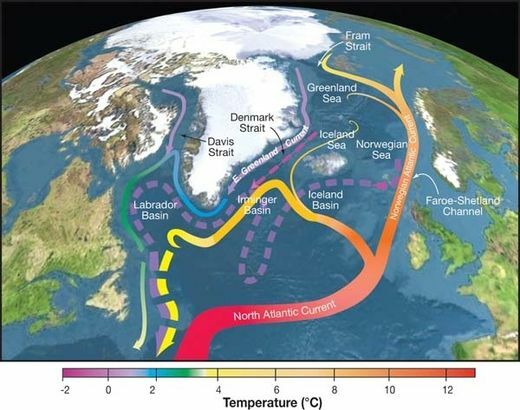 Climate change researchers have detected the first signs of a slowdown in the Gulf Stream – the mighty ocean current that keeps Britain and Europe from freezing. They have found that one of the “engines” driving the Gulf Stream – the sinking of supercooled water in the Greenland Sea – has weakened to less than a quarter of its former strength. The weakening, apparently caused by global warming, could herald big changes in the current over the next few years or decades. Paradoxically, it could lead to Britain and northwestern and Europe undergoing a sharp drop in temperatures. Peter Wadhams, professor of ocean physics at Cambridge University, hitched rides under the Arctic ice cap in Royal Navy submarines and used ships to take measurements across the Greenland Sea. “Until recently we would find giant ‘chimneys’ in the sea where columns of cold, dense water were sinking from the surface to the seabed 3,000 metres below, but now they have almost disappeared,” he said. Such a change could have a severe impact on Britain, which lies on the same latitude as Siberia and ought to be much colder. The Gulf Stream transports 27,000 times more heat to British shores than all the nation’s power supplies could provide, warming Britain by 5-8C. So here we have a prominent climate scientist ‘believer’ (as opposed to a ‘denier’) riding the ‘man-made global warming wave’, like most others, but towards an altogether different conclusion: abrupt and imminent glacial rebound, i.e. a new ice age of one sort or another. With the exception of occasional reports of alternative climate research, the overwhelming media consensus is in line with the position of the UN International Panel on Climate Change (IPCC): the climate system is definitely warming, human activity is definitely to blame, and if measures aren’t taken to address it right now, coastal regions will be under water… perhaps a century from now. 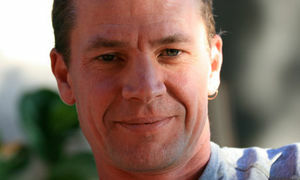 A passer-by found Boyd dead on a bridge near his home in Port Appin on January 27th, 2013. Local police said they ‘believed’ Boyd was struck dead by lightning, citing a storm that had passed through the area and knocked down power and phone lines. A postmortem was apparently conducted, although its results have not been made public. 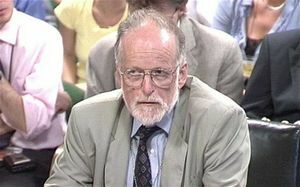 Boyd’s death is reminiscent of the sudden death of former British Foreign Minister Robin Cook. Cook was walking in the Highlands of Scotland on August 6th, 2005 when he suddenly died after suffering a massive heart attack and falling off a ridge. A postmortem examination found that Cook died of ‘hypertensive heart disease’. Some, however, including Liberal Democrat MP Norman Baker, believe that Cook – a prominent critic of the Iraq War and the ‘War on Terror’ – did not die of natural causes, but was the victim of a covert hit by an intelligence agency (presumably British). In case anyone is wondering, inducing heart attacks (or just about any other bodily affliction) from afar is not science fiction. Seymour’s scientific breakthrough was to distinguish the ice surface from the water surface in satellite radar altimeter measurements of ice-covered oceans. This led to the first detailed map of the Arctic gravity field, revealing new tectonic features beneath the seafloor, and water circulation beneath the ice. His work helped give the European Space Agency the confidence to build CryoSat, a satellite dedicated to observing the Earth’s ice-covered regions, launched in 2010. Seymour taught at University College London’s Department of Space and Climate Physics, before moving to the Department of Earth Sciences, where he was director of the Centre for Polar Observation and Modelling. He was awarded his Chair in Climate Physics in 2012. British scientists have discovered an enormous dome of fresh water in the western Arctic Ocean. They think it may result from strong Arctic winds accelerating a great clockwise ocean circulation called the Beaufort Gyre, causing the sea surface to bulge upwards. The researchers made their discovery using European Space Agency (ESA) satellites ERS-2 and Envisat. They measured sea-surface height over the western Arctic over a 15-year period, from 1995 to 2010. Using these measurements, they calculate that since 2002 the sea surface in the western Arctic has risen by around 15cm, and the volume of fresh water has swollen by roughly 8000 cubic kilometres. This is around ten per cent of all the fresh water in the Arctic Ocean. 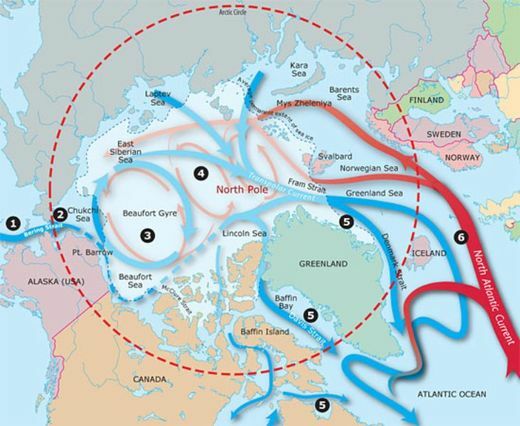 If the wind changes direction, as happened between the mid-1980s and mid-1990s, the water could spill out into the rest of the Arctic and then perhaps even the north Atlantic. This could cool Europe by slowing down a key ocean current derived from the Gulf Stream, which keeps the continent relatively mild compared with countries at similar latitudes. The Gulf Stream forms part of a larger movement of water called the ocean conveyor belt, which is itself one component of the global system of ocean currents. “Satellite data has shown us that a dome of fresh water has been building up in the western Arctic over the past 15 years, due to the wind. 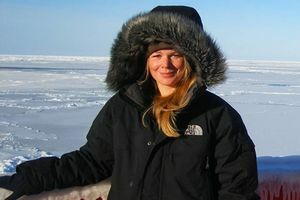 Our findings suggest that a reversal of the wind could result in the release of this fresh water to the rest of the Arctic Ocean and even beyond,” says Dr. Katharine Giles from the Centre for Polar Observation and Modelling (CPOM) at University College London, lead author of the study, published in Nature Geoscience. Giles was killed on April 8th, 2013, while cycling to work through central London. The report of an inquest into her death was made public: the driver of a large truck had failed to notice her ‘coming up his near side’ as he made a left-hand turn. Another cyclist behind Giles witnessed her bicycle being hit. One small thing that stood out about her death was that she was killed at a location that wasn’t on her normal commute. None of her colleagues could say why she might have been on Victoria Street, a location that at least tripled the distance of her normal cycle route. To these three we must add the sudden death of British climate researcher Christopher Bell, 24 years old, a PhD student who worked at SAMS under Tim Boyd. Bell was reported killed, along with three others, by an avalanche at the Scottish ski resort of Glencoe on January 19th, 2013 just 8 days before Boyd. The research interests of all four scientists converged in one area: the consequences of changes in Arctic climate conditions for the thermohaline circulation in the North Atlantic Ocean, where the dilution of saltwater by increased freshwater is widely thought to be a key trigger mechanism that shifts the global climate into, and possibly out of, ice ages. Historical studies abound of glaciation caused by changes in North Atlantic ocean salinity. See here, here and here, for example. But when it comes to directly observed, present-day Arctic conditions, you will rarely see or hear tenured scientists mention ‘ice age’, although ‘global cooling’ does appear in their papers from time to time. The Beaufort Gyre (BG) is a unique circulation component within the Arctic Ocean physical environment with a set of specific atmospheric, sea ice, and oceanic conditions that are interrelated with pan-Arctic as well as global climate systems [Proshutinsky et al., 2002, 2009, 2012; Dukhovskoy et al., 2004; Carmack et al., 2008; Giles et al., 2012, Morison et al., 2012]. Significant negative trends in observed Arctic sea ice extent and thickness over the past decade have prompted numerous discussions about the root causes and consequences of the rapidly changing Arctic climate [e.g., Lindsay and Zhang, 2005; Overland et al., 2008; Kwok, 2008]. Ocean changes in the BG (Figure 1) have been equally as prominent as the disappearing sea ice cover. For example, the BG accumulated more than 5000 km3 of liquid fresh water in the period 2003 – 2012, an increase of approximately 25% [Proshutinsky et al., 2012] relative to the climatology of the 1970s. Not only does this have important consequences for the Arctic sea ice and ecosystems, but a fresh water release from the Arctic of this magnitude could trigger a salinity anomaly in the North Atlantic with magnitude comparable to the Great Salinity Anomaly (GSA) of the 1970s. GSAs can influence global climate by inhibiting deep wintertime convection that in turn can reduce the ocean meridional overturning circulation [Vellinga et al., 2008] and initiate cooling. Whether any or all of these scientists ever fully realize it or not, they have caught a tiger by the tail. They are shy to spell out what that means, but they all understand the implications: severe cooling in the northern hemisphere in the very short term. The unfortunate Peter Wadhams, routinely ridiculed by skeptics because of his exceptional stance on the likelihood of a coming ice age, and now ridiculed by the British press for his statements about the deaths of his colleagues, is desperately trying to protect his reputation. In a recent article in the British Guardian, Wadhams complained that he was misquoted by the Times journalist, that he initially considered the deaths suspicious but has since concluded that, while extraordinary coincidences, they were also “explainable accidents”. He has also lodged a complaint with the UK’s Press Standards Organisation against The Times. For its part, The Times has responded that it has Wadhams’s comments on tape and stands by the story. Watch this space… or the weather over Northern Europe this winter.